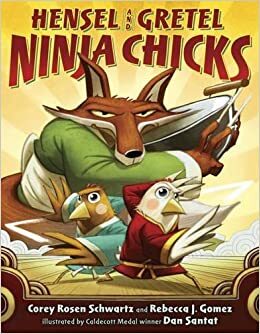 Summary: Brought to you by the same team (with new author Gomez) that produced The Three Ninja Pigs, Ninja Red Riding Hood, and Goldi Rocks and the Three Bears, here’s another martial arts-inspired fractured fairy tale told in rhyme. 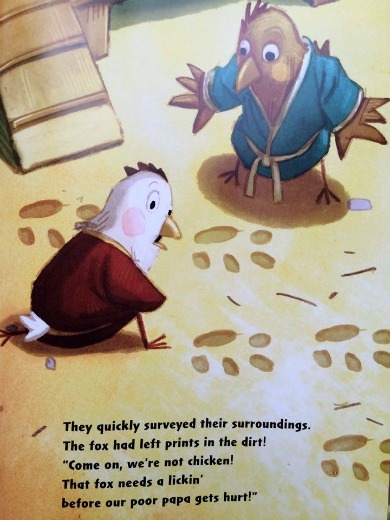 Hensel (renamed from Hansel and now a girl…or “chick”) and Gretel use their martial arts training when they discover their parents held prisoner by a fox in a cornbread house. Hensel gets stuck in a cage, but Gretel’s stealthy ninja moves rescue her. The two chicks combine forces to free their parents and stuff the fox in the cage. Result? “Justice, not dinner was served.” 40 pages; ages 4-8. Pros: As in previous books, the rhymes and vocabulary are hilarious, and Caldecott medalist Santat provides plenty of visual accompaniment. A great read-aloud. Cons: Nothing will ever top The Three Ninja Pigs.